“Birth to 5: Watch Me Thrive!” has been promoting universal, broad-band developmental and social-emotional screening in children ages 0 to 5 years across the health care, early childhood education and social service sectors. With the U.S. federal government and AAP combining forces to promote periodic developmental-behavioral screening, the next step is for the U.S. to address its capacity crisis for providing high-quality early intervention and learning services. A new article in Pediatrics proposes that every U.S. state needs: 1) a family-friendly, screening and care coordination entity, 2) comprehensive, tiered, and equitable assessments for “at-risk” or referred children, 3) universal access to high-quality early learning or preschool programs, and 4) continuous accountability for the early detection process from birth to 5 years, and this includes an outcome-based metric for kindergarten readiness. Leaders in health, education, and social service sectors must boldly address our nation’s capacity crisis in a system-wide manner. US early learning (especially IDEA Part C) services must become more equitable, efficient, and effective so that the focus is always on the developmental-behavioral needs of the child. For more information developmental-behavioral monitoring and training, visit the Learn the Signs. Act Early. Campaign at http://www.cdc.gov/ncbddd/actearly/hcp. A subcommittee of the Early Childhood Six by’15 workgroup authored this commentary: Kevin P. Marks, MD, Adriane K. Griffen, MPH, MCHES, Patricia Herrera, MS, Michelle M. Macias, MD, Catherine E. Rice, PhD, and Cordelia Robinson, PhD, RN. The authors acknowledge and give special thanks to the other members of the Sixby’15 workgroup: Abigail Alberico, Jeffrey P. Brosco, Shannon Haworth, Andy Imparato, Ben Kaufman, Bergen Nelson and Jamie Perry. My wheelchair likes to make a grand entrance when I go into a room. It’s there, it’s large, and it’s up to me to show that I’m in charge. Having a visible mobility aid means that when I go to a job interview, I simply can’t avoid indirect disclosure about being disabled. My body takes care of disclosing for me, loud and clear. However, disability is nuanced far beyond what meets the eye, whether it is a visible or non-visible disability. This can make navigating the disclosure of disability a complex or perhaps even intimidating process for both employees and employers. The key is to strike a balance. For employees, this means determining what, if anything, is necessary to share, and what can and should remain private. For employers, this means inquiring as to how an employee needs to be accommodated without requesting to know personal details that are irrelevant to the job. The problem is that lines on either side are sometimes hazy and easily crossed. I learned this the hard way when I first began searching for jobs after graduating college. I applied for a teaching assistant position at a school for students with disabilities, thinking my personal experience with my disability would ultimately be a positive contribution to the classroom. Unfortunately, when I shared this in answer to one of the first questions asked during my preliminary phone interview, the conversation immediately went south. In this case, my conscious choice to disclose that I have a disability completely backfired, leading the employer to make assumptions that my disability would negatively impact my ability to be an effective teaching assistant – without even taking time to discuss my qualifications for the position. I often think that when interviewing for the teaching assistantship, I didn’t have to disclose my disability in the first place. I choose to look back on that experience as a lesson I’ll always carry with me. Now, I make every effort to ensure that my qualifications speak louder than any preconceived notions. That is difficult, however, as my resumé lends itself to giving quite a few hints that I have a disability, since the vast majority of my work is centered on disability. I’m lucky to find myself at a point in my career where not only am I not afraid to disclose my disability, but also I find it to be a personal selling point. For far too many people, though, this feeling of being comfortable discussing aspects of their disability in the workplace is nonexistent. For many, the mere thought of disclosure frequently brings about fear and raises uncertainties. Will an employer still hire someone if the job candidate is blind and requests screen-reading software to complete work? What if an employee tells a colleague about having a non-visible disability, such as ADHD or bipolar disorder? Will the employer find out and fire the employee? How about if someone uses a wheelchair and requests that hand rails be installed in the company restroom? Not hiring or firing an employee for any of these types of reasons is illegal for entities covered by the Americans with Disabilities Act and the Rehabilitation Act, and yet, the sad reality of the workforce is that discrimination like this continues to happen every day. The provision of reasonable accommodations to ensure employees with disabilities can do their jobs isn’t just the right thing to do; it’s legally required. Justice and equal treatment in the workplace is a right for every person with a disability. And beyond the law, including people with disabilities in the workforce adds depth, richness, and new ideas stemming from the life experiences we bring. Of course, in bringing disability experience to the table, there’s a good chance some disclosure might happen, either during interviews or throughout the course of a job. Questions might come about from employers or other colleagues as work relationships and friendships develop. Because of this, it’s technically accurate for me to say I’ve had employers breach disclosure boundaries, but I know it was with no negative intent and I certainly wouldn’t call it an act of discrimination. Usually, situations like these come from a place of genuine curiosity, concern, or the desire to help. As such, my general rule is to keep things fluid and open when it comes to disclosure. Share if you’re comfortable, but know that you’re never under any obligation to talk about aspects of your disability other than what relates specifically to reasonable accommodation needs. The most important thing to remember is that your disability cannot and should not ever be held against you in a place of work, and if it is, the law is on your side. True progress, though, is found not in abiding by the law for the law’s sake, but in actual acceptance of disability. Disclosure should not be a reason to worry about one’s livelihood, but rather something that makes no difference to how an employer perceives an employee. Everyone brings a unique identity with them to work, and for people who are disabled, our disabilities are just one facet of who we are – at once a potential asset to the workplace and a trait that should never overshadow the value of the skills and experiences we have worked so hard to achieve. Emily Ladau is a writer and disability rights activist whose passion is to harness the powers of language and social media as tools for people to become informed and engaged social justice advocates. She is the owner of Social Justice Media Services, which provides communications, outreach, and social media management services for disability-related organizations. Emily also maintains a blog, Words I Wheel By, as a platform to address discrimination and to encourage people to understand the experience of having a disability in more positive, accepting, and supportive ways. You’re welcome to connect with her on Facebook and Twitter. The nTIDE Report from the Kessler Foundation and University of New Hampshire has come out with its March findings. For the sixth consecutive month, more people with disabilities are finding employment. Increasing from 24.6 percent in March 2014, the employment-to-population ratio is now 27.2 percent. Additionally, the labor force participation rate has gone up from 29.5 percent March of last year to 31.1 percent for March 2015. The new Impact: Feature Issue on the ADA and People with Intellectual, Developmental, and Other Disabilities, from the Insititute on COmmunity Integration, University of Minnesota is now available online. 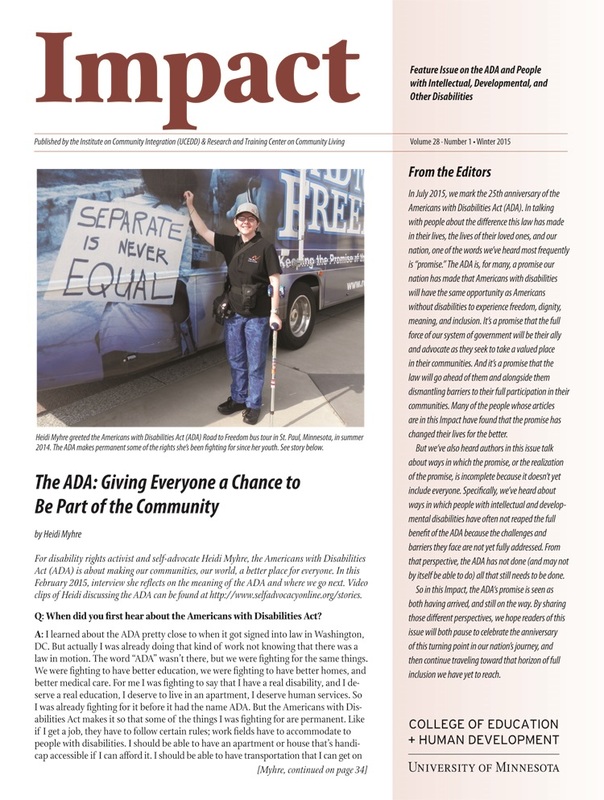 This issue marks the 25th anniversary of the Americans with Disabilities Act (ADA) with articles by individuals with disabilities, families, advocates, service providers, researchers, and others talking about how the ADA has made a difference in their lives, the lives of their loved ones, and in our nation. At the same time, this Impact also focuses on ways in which the ADA hasn’t fully addressed a number of the barriers faced by people with intellectual and developmental disabilities as they seek equal opportunity and inclusion in their communities. By sharing this range of perspectives, this Impact issue encourages readers to both pause to celebrate the anniversary of the ADA as a turning point in our nation’s journey, and continue traveling toward that horizon of full inclusion we have yet to reach. View the pdf version of the issue here. Get the text version. If you would like a complimentary print copy of this issue of Impact email the Institute’s Publication Office at icipub@umn.edu or call 612-624-4512. When preparing for college it may be helpful to complete a readiness assessment to ensure that you are prepared and ready to start taking charge of your own health care. When visiting campus, make note of which health care centers/clinics are close to or on your campus. It’s essential to know who your insurance provider is and what types of services it covers so that you can make a decision about which clinic is the best fit for you. Even if your primary care provider will not be located on campus, get to know your student health center. Find out what services they provide – for things like updating your immunizations and filling your prescriptions, this may be more convenient to do on campus. Most student health centers also have information and resources regarding sexual health, which is also important to take into account when managing your own health care. It’s important to give an updated medical summary to your new health care provider. I also carried it with me on a USB flash drive in case of a medical emergency. The summary helped me remember the details of my past medical procedures and the names/doses of medications that I was taking. Lastly, don’t hesitate to reach out to your campus Office of Disability Services. As a person with a disability, I knew that it was crucial for me to have certain accommodations regarding my health in order to complete my coursework successfully. This office helps secure reasonable accommodations for students with disabilities to allow you to have equal opportunities in education. Disclosing your disability to your professors will be entirely up to you, and you shouldn’t feel pressured to do so if you are uncomfortable. You may find it helpful to do so, especially to allow them to maintain flexibility with you and your coursework. When beginning a new job, it is up to you how much you disclose to your employer about your health needs and what you do or do not request for accommodations. While you may not want to bring attention to your health condition, the more you explain to your manager or employer ahead of time, the more they can support you or be able to prepare for if you do need to miss work. Another thing that gets more complicated once you are working is balancing your medical appointments with your job. Often, providers only have office hours when you are working so it will be up to you to figure out when you schedule appointments. This also means that you will have to prioritize what providers you see. Health needs that need to be addressed may become a higher priority than a check-up or well-visit appointment. Sometimes, you may need to make the decision to take a day off with no appointments so that you can rest and make sure you are taking care of you in between medical appointments. Because of the limited time you may have when you are working, it is especially important that you know how to make the most of the time you do have with your providers during appointments. The tools offered at www.GotTransition.org can help you become confident in understanding your own needs and having those conversations. Their Resources page even includes a list of sites and information dedicated to Employment and Transition. President Obama announced a new initiative to make $100 million available through the Department of Labor to support moving lower skilled workers with barrriers to training and employment through fast paths to mid- to high- information technology jobs. This initiative, TechHire, will begin with 20 cities with over 150,000 technology jobs and 300 employer partners. The main features of TechHire includes increase access to training opportunities, employer engagement relating to accelerated learning and opportunities, and accelerated learning strategies to provide fast paths to competitive employment. Applications are planned to be available by the end of 2015. Read a detailed fact sheet on the TechHire initiative here. The February report from Kessler Foundation and University of New Hampshire shows continuous growth for employment for people with disabilities for the fifth consecutive month. The Bureau of Labor Statistics’ Job Report showed that labor force participation has increased from 29.5 percent in February 2014 to 31.1 percent in February 2015. Additionally, the employment-to-population ratio has increased from February of last year from 24.6 percent to 27.3 percent for February of this year. To read more on the February nTIDE update click here. In February, a resource guide for employers has come out about best practices for hiring people with disabilities. This guide is part of the Curb Cuts to the Middle Class Initiative and written mainly by individuals from the Equal Employment Opportunity Commission. The guide focuses on four main areas of best practices including recruiting candidates, respecting employees with disabilities, providing reasonable accommodations, and legal framework. View the entire toolkit here. Gone are the days of “let’s just wait and see if he/she will grow out of it.” The federal-level initiative, Birth to Five: Watch Me Thrive!, is heavily promoting developmental-behavioral screening in children 0 to five 5 of age. Healthcare providers are routinely screening children for developmental delays, autism, behavioral problems and “at-risk conditions. Politicial candidates in 2016 should know this new “standard of care” has dramatically increased referral rates to early intervention (EI) programs. The next step is to improve our early detection and intervention system for delayed and at-risk/disadvantaged children. For every dollar spent on high-quality early learning, there’s a 7-10 percent annual return rate in cost savings to society—and the younger the child served, the wiser the investment. Although the overall outlook for people with disabilities seeking employment in 2014 was tough, the last three months showed significant improvement that will hopefully lead into a more positive 2015. The employment-to-population ratio for 2014 declined to an average of 26.0 percent, falling from 26.8 percent in 2013. Additionally, the average monthly labor force participation rate dropped from 31.4 percent in 2013 to 30.2 percent in 2014. While these average numbers do not show a positive trend for people with disabilities in employment, October through December showed an increase in employment-to-population ratio than in those months respectively in 2013. December also had a higher labor force participation rate since December 2013.Hopefully these positive trends will continue into 2015.